This is a simple silicon Fuzz Face clone with added features. You can find all the info on their site here. 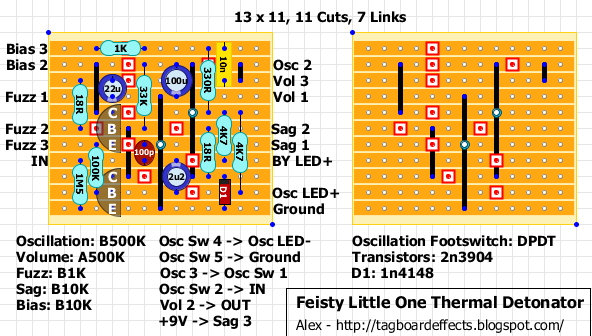 The original thread with schematic is available on the FSB forum here. Looks very interesting. Actually it's always interesting to find little mods for any Fuzz Face. Anyone out there to verify the design? 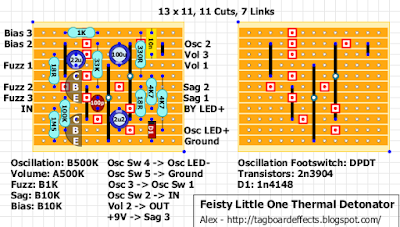 hey first time poster could some one please elaberate on the input wiring do i wire input to osc sw2 or to the input on circut ? Hi there, it's a really cool project ! Thanks a lot ! I'm heading to the end but I got a problem. I don't have a 3pdt but a Dpdt foot switch for the bypass. Can it do the work ? If yes, who's gonna go where ? Thks for helping me ! Massive fun pedal. It just keeps giving does this one. Loads and loads of different sounds.